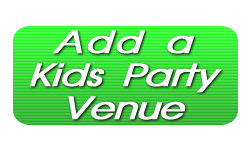 If you have a Kids Party Venue available for childrens parties and more, advertise your venue in The Kids Party Venue Directory. Our Kids Party Venue website is a perfect way to advertise your event venue for any kids party or family event! FECs (Family Entertainment Centers) – Indoor Bounce and Play Places – Rec Centers – Soft Play Centers – Kids Gyms – Fun Parks and MORE! Add your Kids Party Venue today!